EHFAS - EMT EHFAS - What Is An EMT? People’s lives often depend on the quick reaction and competent care of emergency medical technicians (EMT's) and paramedics—EMT's with additional advanced training to perform more difficult pre hospital medical procedures. Incidents as varied as automobile accidents, heart attacks, drowning's, childbirth, and gunshot wounds all require immediate medical attention. EMT's and paramedics provide this vital attention as they care for and transport the sick or injured to a medical facility. In an emergency, EMT's and paramedics typically are dispatched to the scene by a 911 operator, and often work with police and fire department personnel. Once they arrive, they determine the nature and extent of the patient’s condition while trying to ascertain whether the patient has preexisting medical problems. Following strict rules and guidelines, they give appropriate emergency care and, when necessary, transport the patient. Some paramedics are trained to treat patients with minor injuries on the scene of an accident or at their home without transporting them to a medical facility. Emergency treatment for more complicated problems is carried out under the direction of medical doctors by radio preceding or during transport. EMT's and paramedics may use special equipment, such as backboards, to immobilize patients before placing them on stretchers and securing them in the ambulance for transport to a medical facility. Usually, one EMT or paramedic drives while the other monitors the patient’s vital signs and gives additional care as needed. Some EMT's work as part of the flight crew of helicopters that transport critically ill or injured patients to hospital trauma centers. At the medical facility, EMT's and paramedics help transfer patients to the emergency department, report their observations and actions to emergency room staff, and may provide additional emergency treatment. After each run, EMT's and paramedics replace used supplies and check equipment. If a transported patient had a contagious disease, EMT's and paramedics decontaminate the interior of the ambulance and report cases to the proper authorities. Beyond these general duties, the specific responsibilities of EMT's and paramedics depend on their level of qualification and training. To determine this, the National Registry of Emergency Medical Technicians (NREMT) registers emergency medical service (EMS) providers at three levels: First Responder, EMT-Basic,, and EMT-Paramedic. Some States, however, do their own certification and use numeric ratings from 1 to 4 to distinguish levels of proficiency. 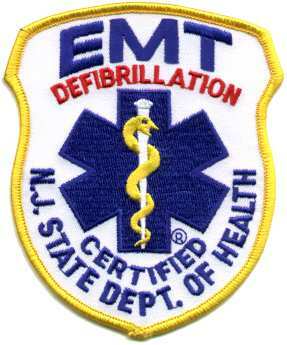 The EMT-Intermediate (EMT-2 and EMT-3) have been eliminated from state certification levels. Formal training and certification is needed to become an EMT or paramedic. A high school diploma is typically required to enter a formal training program. Some programs offer an associate degree along with the formal EMT training. All 50 States have a certification procedure. In most States and the District of Columbia, registration with the NREMT is required at some or all levels of certification. Other States administer their own certification examination or provide the option of taking the NREMT examination. To maintain certification, EMT's and paramedics must reregister, usually every 2 years. In order to reregister, an individual must be working as an EMT or paramedic and meet a continuing education requirement. Training is offered at progressive levels: EMT-Basic.. EMT-Basic coursework typically emphasizes emergency skills, such as managing respiratory, trauma, and cardiac emergencies, and patient assessment. Formal courses are often combined with time in an emergency room or ambulance. The program also provides instruction and practice in dealing with bleeding, fractures, airway obstruction, cardiac arrest, and emergency childbirth. Students learn how to use and maintain common emergency equipment, such as backboards, suction devices, splints, oxygen delivery systems, and stretchers. Graduates of approved EMT basic training programs who pass a written and practical examination administered by the State certifying agency or the NREMT earn the title “Registered EMT-Basic.” The course also is a prerequisite for EMT-Intermediate and EMT-Paramedic training. The most advanced level of training for this occupation is EMT-Paramedic. At this level, the caregiver receives additional training in body function and learns more advanced skills. The Technology program usually lasts up to 2 years and results in an associate degree in applied science. Such education prepares the graduate to take the NREMT examination and become certified as an EMT-Paramedic. Extensive related coursework and clinical and field experience is required. Because of the longer training requirement, almost all EMT-Paramedics are in paid positions, rather than being volunteers. Refresher courses and continuing education are available for EMT's and paramedics at all levels. EMT's and paramedics should be emotionally stable, have good dexterity, agility, and physical coordination, and be able to lift and carry heavy loads. They also need good eyesight (corrective lenses may be used) with accurate color vision. Advancement beyond the EMT-Paramedic level usually means leaving fieldwork. An EMT-Paramedic can become a supervisor, operations manager, administrative director, or executive director of emergency services. Some EMT's and paramedics become instructors, dispatchers, or physician assistants, while others move into sales or marketing of emergency medical equipment. A number of people become EMT's and paramedics to assess their interest in health care, and then decide to return to school and become registered nurses, physicians, or other health workers. Working ConditionsEMT's and paramedics work both indoors and outdoors, in all types of weather. They are required to do considerable kneeling, bending, and heavy lifting. These workers risk noise-induced hearing loss from sirens and back injuries from lifting patients. In addition, EMT's and paramedics may be exposed to diseases such as hepatitis-B and AIDS, as well as violence from drug overdose victims or mentally unstable patients. The work is not only physically strenuous, but can be stressful, sometimes involving life-or-death situations and suffering patients. Nonetheless, many people find the work exciting and challenging and enjoy the opportunity to help others. EMT's and paramedics employed by fire departments work about 50 hours a week. Those employed by hospitals frequently work between 45 and 60 hours a week, and those in private ambulance services, between 45 and 50 hours. Some of these workers, especially those in police and fire departments, are on call for extended periods. Because emergency services function 24 hours a day, EMT's and paramedics have irregular working hours. EmploymentEMTs and paramedics held about 192,000 jobs in 2004. Most career EMT's and paramedics work in metropolitan areas. Volunteer EMT's and paramedics are more common in small cities, towns, and rural areas. These individuals volunteer for fire departments, emergency medical services (EMS), or hospitals, and may respond to only a few calls for service per month or may answer the majority of calls, especially in smaller communities. EMT's and paramedics work closely with firefighters, who often are certified as EMT's as well and act as first responders. A large number of EMT's or paramedics belong to a union. Full-time and part-time paid EMT's and paramedics were employed in a number of industries. About 4 out of 10 worked as employees of private ambulance services. About 3 out of 10 worked in local government for fire departments, public ambulance services, and EMS. Another 2 out of 10 were found in hospitals, working full time within the medical facility or responding to calls in ambulances or helicopters to transport critically ill or injured patients. The remainder worked in various industries providing emergency services.